FILE - In this photo released by Thai Spokesman Office, Gen. Prayuth Chan-ocha speaks after he accepted a written royal command issued by King Bhumibol Adulyadej certifying his appointment as the country's 29th premier in Bangkok, Aug. 25, 2014. Friday marks one year since Thailand's then army chief, Prayuth Chan-ocha, staged a bloodless coup — the latest in a long series of military removals of elected governments. Since carrying out the May 22, 2014 coup, the general has retired from the military but is still firmly in charge, with his appointment as prime minister by a hand-picked legislature. He recently lifted martial law, but Article 44 of the junta's interim charter ensures he dominates. “The bottom line is the acts or laws still give the sweeping power to General Prayuth, right? But if you look into the situation on the ground I think most of the Thai people understand that the way prime minister Prayuth Chan-ocha uses power is in a very constructive way,” said army major general Weerachon Sukhondhapatipak, a spokesman for the junta, formally known as the National Council for Peace and Order. Thailand's Prime Minister Prayuth Chan-ocha listens to a question from a reporter during a press conference at the government house in Bangkok, Thailand, Tuesday, March 31, 2015. Prayuth dispenses advice on his weekly Friday night broadcast carried on all Thailand's TV channels. He warns the indebted not to shop too much. He implores citizens to lend a hand and help unclog culverts. Advice is also dispensed on crop cultivation. In his frequent parries with the press he is less folksy — once warning reporters he can have them executed if their stories displease him. The career army man has not put anyone before the firing squad. There are no tanks on the streets of Bangkok, no soldiers patrolling as was seen in the tense days immediately after the coup, which followed a prolonged period of sometimes violent political turmoil. But it is a deceptive scene, according to junta opponents. The rural poor — who propelled parties backed by former prime minister Thaksin Shinawatra into power in every election since 2001 — will not tolerate being disenfranchised, according to former members of the government of Yingluck Shinawatra, who was forced out as prime minister two weeks before last year's coup. “There has been a political awakening in the North and Northeast. They want in, but the elites do not include them," former national security advisor Sean Boonpracong told VOA. "I see trouble down the road." The military has vowed to eradicate color-coded politics, which for years has pitted the core Thaksin supporters — the rural red shirts — against the urban yellow shirts, who are ardent royalists and strongly oppose the Shinawatra clan, accusing it of being corrupt and harboring questionable loyalty to the crown. The junta's opponents see the generals siding with the yellow shirts. Thailand's former Prime Minister Yingluck Shinawatra, center, walks through supporters as she leaves the Supreme Court in Bangkok, Thailand, Tuesday, May 19, 2015. Yingluck was retroactively impeached by the junta's hand-picked legislature (making her ineligible for five years to run for political office). And on Tuesday she entered a not-guilty plea as a trial commenced to try her on charges of dereliction of duty resulting from a bungled rice subsidy scheme. A conviction could land her in prison for a decade. 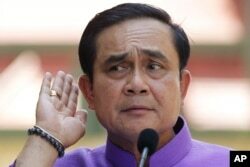 "I am confident in my innocence," the former prime minister told reporters. "I hope the court will grant me justice, and that everything will go according to due process under the law." Her elder brother, Thaksin, has been in self-imposed exile since a 2008 corruption conviction his supporters also regard as politically motivated. In a rare public appearance, Thaksin, in Seoul on Tuesday for an Asian leaders' conference, told reporters that while he was dissatisfied with the junta's performance he does not intend to mobilize his supporters and they should not resort to violence. A year after the coup, few dare in public to express opposition to the coup in an atmosphere where symbolic public acts of disobedience, such as eating a sandwich or reading a copy of the dystopian novel "1984," can prompt arrest. Two red shirt activists were detained this week at a Bangkok police station for 10 hours after being spotted wearing shirts displaying a three-fingered salute, according to a researcher in Thailand for Human Rights Watch. The gesture, taken from the "Hunger Games" movies, was adopted by coup opponents last year as a sign of defiance. "The downfall of the dictatorship is not a matter of doubt but a matter of time," declared Pravit Rojanaphruk on his Twitter account on Wednesday. The columnist for the English-language daily newspaper The Nation was summoned by the military shortly after last year's coup and is one of the few Thai media figures still expressing such overt opposition to military rule. There is one critical element the military and police generals cannot seem to keep in line despite harsh decrees or the threat of detention: the economy. Data indicate it is stumbling, knocked off balance by the coup. “If the military could manage the economic transition as good as Thai civilian governments then the Thai people could accept the military ruling. But, so far, the trend hasn't been positive for the military when it comes to running the country," said former Yingluck administration security advisor Sean Boonpracong. The junta spokesman contends the military government inherited a dysfunctional system from the Pheau Thai party it is still struggling to repair. “It's not because we are incompetent in dealing with the economy. It's because of the slowing down of the global economy, as well. But we are confident that our economy will start to pick up,” said General Weearachon in a VOA interview. The public will not get an opportunity to directly express its sentiments on the junta's performance until, at least, next January. That is when a national referendum on a recently-drafted new constitution might be held. At 50,000 words and containing 315 articles the charter would be more voluminous than any of Thailand's previous 19 constitutions over the past 80 years. The draft constitution decrees only those with "good morals" govern Thailand. Its critics say the generals and their handpicked members of the elite will decide who passes that morality test, allowing them to continue to hold power once the junta relaxes its grip. The language in the draft document would allow office holders to be removed for even "harsh or impolite language," according to a former cabinet minister both Shinawatra administrations. He says the constitution's ambiguous wording would allow the elites to "easily get rid of people they don't desire." "These 'good people' will really have control over all branches of government," predicts another former liberal lawmaker who served in previous cabinets. "Once this draft is promulgated it'll never be amended peacefully," said the same ex-politician who recently spoke to a small group of correspondents in a Bangkok restaurant on condition he not be named. "This draft will lead this country to more severe conflicts." Prominent members of the conservative Democrat Party are also expressing misgivings with the proposed Constitution. Former prime minister Abhisit Vejjajiva is worried its language will usher in a "parliamentary dictatorship." He prefers the public be allowed to choose between the charter the junta is promulgating and the so-called 1997 "People's Constitution," which was swept aside following a military coup in 2006. If a referendum is conducted, a general election could not be held until late August or early September 2016, according to deputy prime minister Wissanu Krea-ngam. But Wissanu cautioned on Wednesday the referendum is not a sure thing. Junta officials say they need sufficient time for reform, ensuring there will not be a repeat of damaging political gridlock. "We are working according to the roadmap [for reform]," explained General Weerachon. The junta has bristled at domestic and external criticism that the pace is too slow, costing Thailand international credibility. General Weerachon, in a VOA interview, denied Bangkok was warming ties with Beijing because of the cold shoulder from Washington and European capitals and stressed how Thailand values the nearly 180-year-old relationship. "We are not seeking to play a China card or Russia card," he said. The cards, however, which trump all others in Thailand are the royal ones. The revered but elderly King and Queen have been in poor health for years. The royal couple returned to a seaside palace in Hua Hin on May 10 after an extended hospital stay in Bangkok. The military desires to be in control for the inevitable and highly emotional period of monarchial succession, according to former government officials. Thailand's King Bhumibol Adulyadej sits in a vehicle as he leaves Siriraj Hospital for the Grand Palace to join a ceremony marking Coronation Day in Bangkok, Thailand, May 5, 2015. King Bhumibol Adulyadej is 87 years old. Heir apparent, Crown Prince Vajiralongkorn, 62, has not achieved the same level of popularity as his father's. More frequently seen in public these days is Princess Sirindhorn, 60, the king's second daughter. Public speculation about royal transition is off-limits here. Thailand's harsh lese majeste laws, especially Article 112 of the Criminal Code, also restrain media reports about the senior contemporary figures of the Chakri dynasty, which began ruling Siam (as the kingdom was then known) in 1782. There has been an "unprecedented" number of detentions under Article 112 since last year's coup, according to the International Federation for Human Rights (FIDH). Those taken into custody have included anti-coup activists, a bookseller, a pair of theatrical actors and a mentally ill man. Such prosecutions "are likely to continue at a steady pace in the coming months," FIDH predicts. Royalists argue that zealously protecting the monarchy's good name at this critical juncture is paramount, as it is Thailand's Buddhist spiritual core. But critics question whether the prosecutions are being utilized by the insecure among the powerful elite, anxious about the kingdom's future path.